About 90% of the people respond with a sigh, followed by a “oh man, don’t get me started.” The other 10% are probably chairing those meetings 🙂 . Typical complaints are: too long, too many different issues, no clear action points, no follow-up on those action points, etc. Do these business meetings matter? How important are business meetings? There is a significantly positive relationship between effective meetings* and the internal and external effectiveness of an organisation. 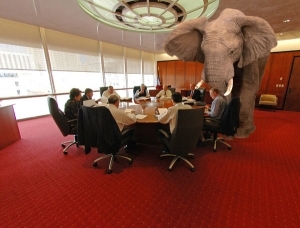 If effective meetings are so important and so many say they are not effective… then why don’t we do something about it? We have found that significantly improving meetings is rather easy: All you need is an exciting one day workout to turn long, energy consuming meetings into effective, energy-giving meetings… Why don’t we do something about it? * Meeting effectiveness was measured by procedural effectiveness of the meeting, the attendance rate, and the efficacy of facilitation.